Valentine’s day is coming up and we all know what that means right? Chocolate, cake, sweets, desserts for the next 3 weeks, all low-carb, gluten-free and sugar-free of course 🙂 I’ll be uploading a bunch of sweets in the next few weeks to get ready for Valentine’s day! 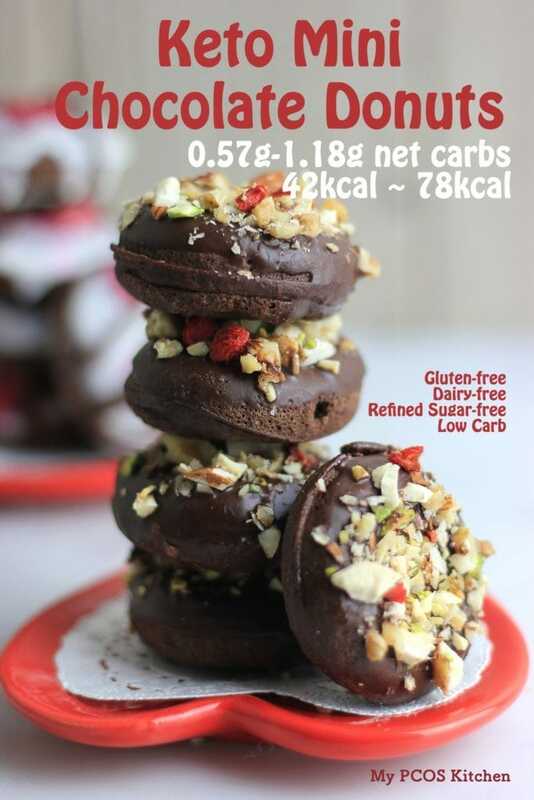 The first recipe that I’d like to introduce is these Low Carb Chocolate Donuts! 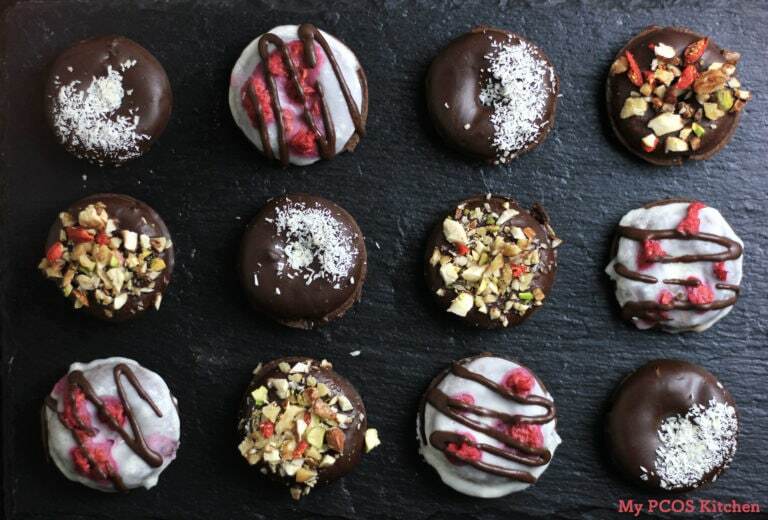 These donuts are entirely gluten-free and dairy-free. I also didn’t used any refined sugar, just erythritol and stevia powder! 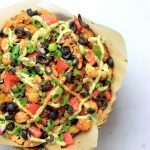 I wasn’t sure what type of toppings I should do, so I just decided to do a whole lot of different ones and experiment with the different ingredients I had at home. I knew they were all going to be with a chocolate base, but I didn’t know if I was going to use melted chocolate or use coconut butter. I decided to make all the different sauces with either coconut butter or coconut oil. 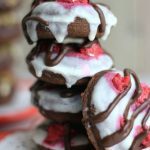 In the versions where I coated the donuts in chocolate sauce, I used coconut oil and cocoa powder, and in the version where there is a why sauce over the donut, it’s actually dipped in some soft coconut butter, topped with crushed raspberries and drizzles with chocolate coconut butter. I was really happy with how they turned out. As soon as my boyfriend came over, I made him try to see if he would like them because he doesn’t eat a low carb diet. He couldn’t even tell that I hadn’t used sugar or wheat! Bahaha, I managed to fool him with some healthy treats! So because I live in Japan, the way couples celebrate Valentine’s Day is very different than back in Canada. Valentine’s day is actually a day where women give gifts, well mostly handmade chocolate, to their boyfriends or friends, and the men don’t actually give anything to women! Instead, they are supposed to give back to woman, in double quantity, chocolates or flowers exactly a month later on March 14th! So this Valentine’s day, it’s my job to create homemade sweets and chocolates and next month my darling will be giving me some back! 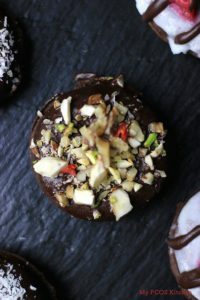 Delicious little donuts that will curve any cravings! 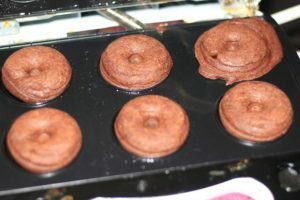 Plug in the mini donuts maker and let it warm up. 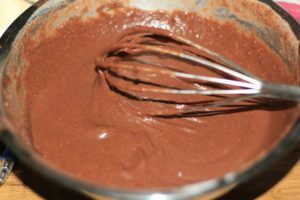 In a bowl, mix the dry ingredients together with a whisk. 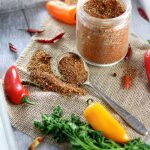 In a separate bowl, mix the wet ingredients together. 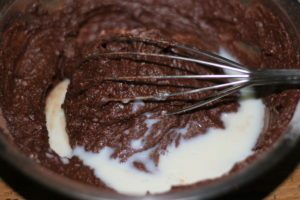 Pour the wet into the dry ingredients and whisk until combined. Lightly oil the donuts molds with a bit of coconut oil to prevent sticking. 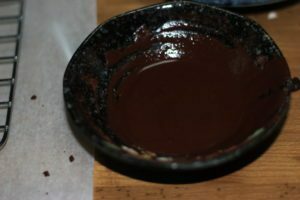 Pour a bit of the chocolate batter into each hole, barely filled to the top, close the lid and bake for 3-4 minutes. Repeat this step until you have used all of the batter. It should make about 20 donuts. Let cool on a wire rack, while we make the different toppings. 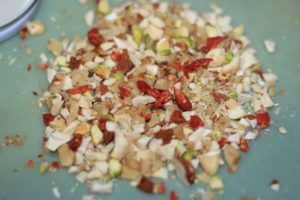 Chop the nuts and goji berry into tiny pieces and mix together. 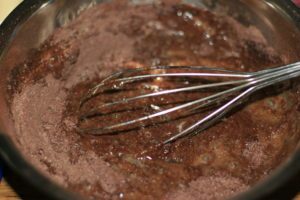 In a small bowl combine the coconut oil, stevia powder and cocoa powder. If the coconut oil is hard, microwave it for a few seconds first. Wait until the chocolate sauce cools down has the consistency of honey before dipping the donuts in it. If it's winter, it should take a couple of minutes on the countertop, but if it's summer, you'll need to refrigerate it for a few minutes. 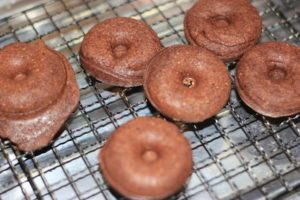 Once thick, dip the top of each donut into the chocolate sauce. 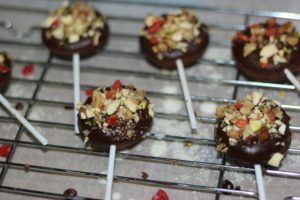 Immediately top with the chopped nuts while the chocolate sauce is still runny so that they can stick. Once coated, let them cool on the counter (in winter) or in the fridge (in summer). *If the chocolate sauce hardens up, just microwave it for 3-5 seconds until it's soft again. 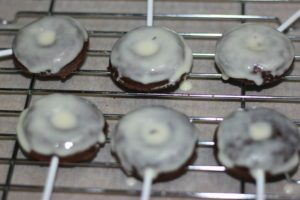 Once thick, dip the top of each donut into the chocolate sauce. 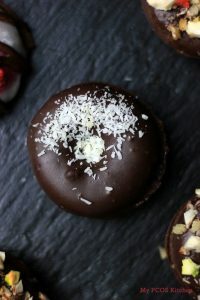 Immediately top half of the donuts with the coconut flakes while the chocolate sauce is still runny so that they can stick. Once coated, let them cool on the counter (in winter) or in the fridge (in summer). 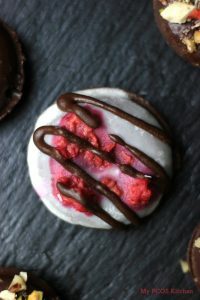 Add the frozen raspberries to a small bowl and microwave for 30 seconds. Take them out and crush with a fork. 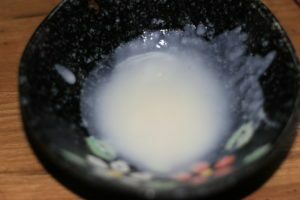 In a small bowl, add 3 tbsp of coconut butter. If it's hard, just microwave it a few seconds until soft. Dip the top of each donut into the coconut butter and let cool on a wire rack. 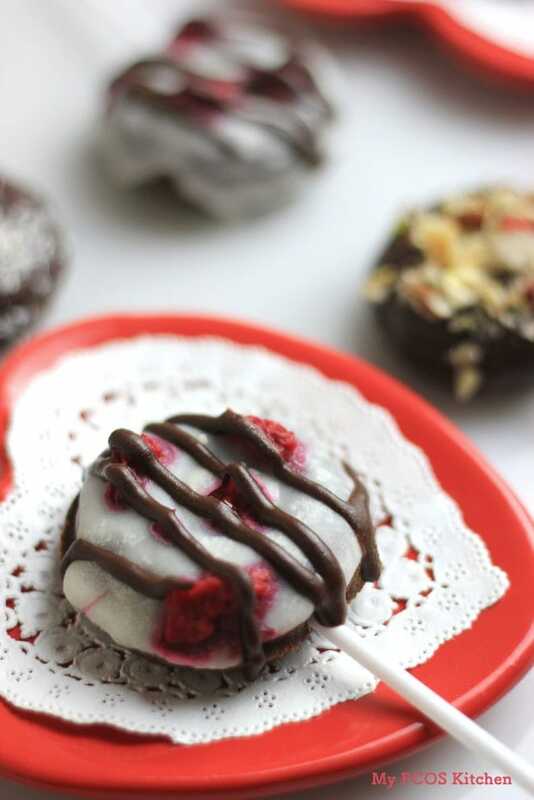 Carefully place a few pieces of the crushed raspberries on each donut. 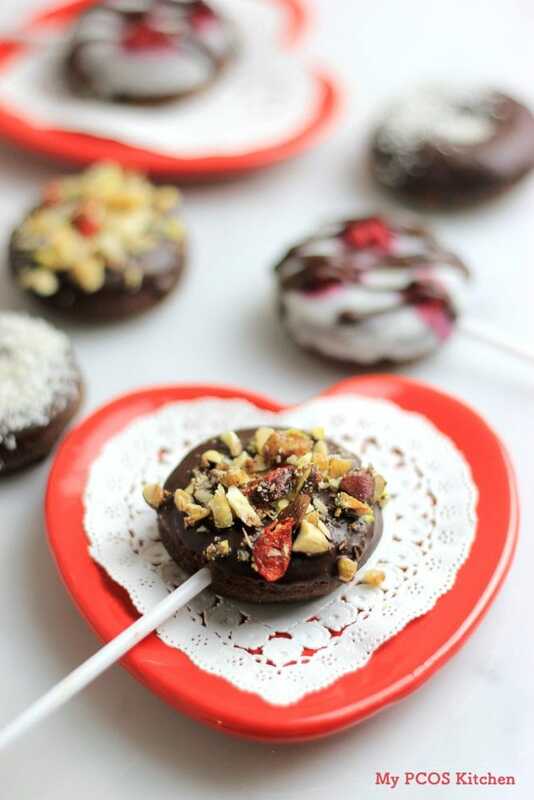 Transfer the coconut chocolate sauce in a piping bag attached with a 3mm round tip. 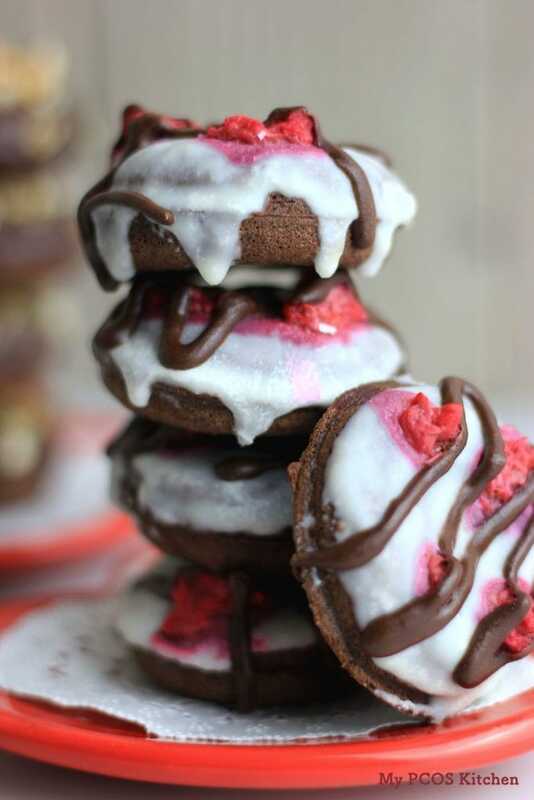 Drizzle the chocolate sauce over each donut. Let cool on the counter (in the winter) or the fridge (in summer). Keep the donuts refrigerated in summer, or on the counter in winter in a sealed container. Feel free to decorate them as you wish. 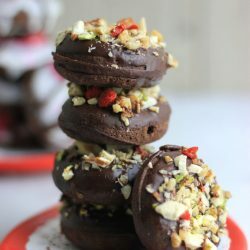 Just wanted to ask, since it’s hard to find a vegan, nut-free, keto donut… what do you think I can replace the cacao powder with if I just want a regular tasting donut base (that I can drizzle with matcha / green tea). I’d love to make this again today but just plain! I’d try about 350-375 for 10-20 minutes depending on how big your donut molds are! How cute are these mini donuts? They look incredible!